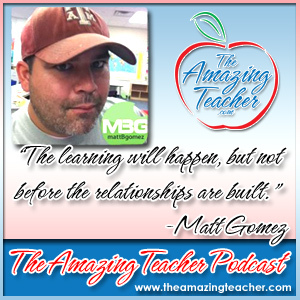 This week, my guest on the Amazing Teacher Podcast is Matt Gomez from MattBGomez.com. Matt is a Kindergarten teacher in N. Dallas, Texas and the co-founder and an organizer for EdcampDallas. He is also a moderator for the twitter chat #Kinderchat. I had a great time picking Matt’s brain on the podcast. He shares about the importance of building relationships – with everybody – parents, teachers, administrators, and especially students. He also talked about EdCamp Dallas. As an organizer, Matt shared how EdCamp allows teachers to share their expertise with each other – What a concept! Matt is also leading the way with incorporating technology in the classroom. His Kindergarten class has a Twitter account – yes – a Kindergarten Twitter account! His class connects with other classes around the world. Amazing! Matt also is big on helping kids find their passion, and giving them a way to express their passion. 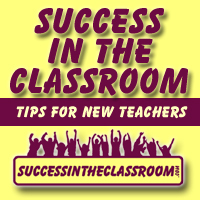 He has eliminated the classroom management systems that many Kindergarten teachers use, and he has built his classroom management on relationships and the “Be Brave” rule. He says that it’s been an amazing change for him and for the kids. It was great spending time with Matt and picking his brain. I came away with an even greater appreciation for Kindergarten teachers. I know you will find great value in what Matt shares in the podcast as well.